– Many-Me Angel solution is evolving! Many-Me Angel solution is evolving! 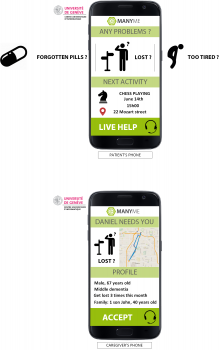 Scientific experts from University of Geneva (UNIGE, Many-Me project Partner) intensively work on the solution called Many-Me Angel: the application, providing patients on the middle stage of dementia with a responsive system that offers them support when and if necessary to increase their safety, autonomy, and participation in social life. Thanks to Many-Me Geneva’s meeting, and especially during the interaction between UNIGE’s research team and end-users partners, scientists came to the idea that even the best algorithm cannot replace human judgment. – We decided in case of freezing or turning around situations, detected on patient’s phone directly, to still display an alert screen for the patient, but also to send some relevant data (like the last saved positions or the time being freezing) to informal caregivers – explains Jonathan Bertolaccini, scientific expert of UNIGE. As explorers learned, sometime dementia people can deny the current state in which they are. Moreover relatives know their parents habits (for instance sitting on a bench 1h to read newspapers is normal). Relatives or informal caregivers will receive a notification. By clicking on it, they will be able to decide if there is a problem or not, to call directly the patient, or to forward the patient case to a formal caregiver. In that final case the formal caregiver will handle the problem directly. Scientists are defining the overall architecture of the system now, to make this solution comes true.